There is no better way to start children in music! Our comprehensive program lays the foundation for a lifetime of musical enjoyment and prepares students for any instrument. Our fully-equipped classrooms have everything necessary for our students to thrive including a keyboard for every child. See What Our Group Program is All About! Parent and child participate together in this weekly, 30 minute class. 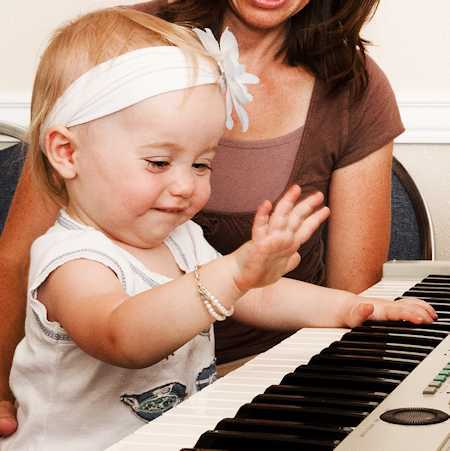 Babies are introduced to basic musical elements such as rhythm, pulse, pitch, listening and singing. Students develop large motor skills through movement to music, playing rhythm instruments and exploratory keyboard playing. Story time reinforces lesson concepts. Parent and child participate together in this weekly, 30 minute class. 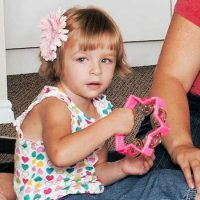 At this perfect time in their development, toddlers develop their eager ears through singing and learning solfege (Do, Re, Mi syllables). Large motor skills are developed through movement to music and playing rhythm instruments (bells, drums, wood blocks, triangles, etc.) and small motor skills are developed using finger plays and preparatory keyboard playing. Story time reinforces lesson concepts. Parent and child participate together in this weekly, 45 minute class. At this perfect time in their development, students develop their eager ears through singing and learning solfege (Do, Re, Mi syllables). Large motor skills are developed through movement to music and playing rhythm instruments (bells, drums, wood blocks, triangles, etc.) and small motor skills are developed using finger plays and preparatory keyboard playing. Students learn notes and simple songs at the keyboard and on music. Class members play together in ensembles. Parent and child participate together in these weekly, 50 minute classes. 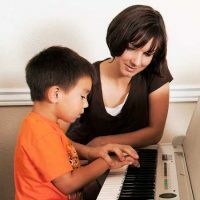 Students learn to read music and play the piano in this comprehensive music course. Ear training skills are developed through singing, solfege (Do, Re, Mi syllables), and by-ear keyboard playing. In addition to learning notes and chords, music theory is reinforced through arranging, improvising, transposing and composing. Students play ensembles with other class members at the keyboard and on rhythm instruments. 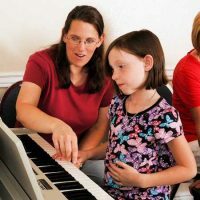 By the end of their first semesters, students are playing outside of the 5-finger range and know 10 (Piano Pals), 14 (Mighty Musicians) or 16 (Keyboard Kids) different notes. By the end of their last semester, students are playing in six different keys. 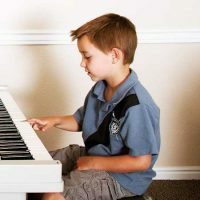 The Piano Pals, Mighty Musicians, and Keyboard Kids classes cover essentially the same concepts. However, older classes are able to move more quickly.